Where do you start when shopping for something online? For years, it’s been a close fight of Google versus Amazon, with the latter staying one step ahead in consumer preference. But that’s all about to change, with Google Shopping Actions, the newest innovation from the search giant that plans to help independent retailers wrestle more customers away from Amazon. Today we’re diving into this new marketplace that is a direct competitor to Amazon, eBay and other major marketplaces and how you can benefit from the program. As with any innovation, this new program introduces some questions, which we’re here to help you find answers to. How is Shopping Actions different from Google Shopping? Who can take part in Shopping Actions? How do you sign up for Google Shopping Actions? How can Google Shopping Actions help me compete with Amazon? 1. What is Google Shopping Actions? 2. How are Shopping Actions different from Shopping Ads? 3. How does it compete with Amazon? 4. How is it innovative? 5. How can Google Shopping Actions help me? 6. How do I sign up for Google Shopping Actions? Pretty early on, Google realized that people aren’t just searching for information on the web, they’re searching for products. Google Shopping itself was created as a response to Amazon’s grip on retailers, as a way to discover, research and buy products is a simple way, that enhanced the overall shopping experience. The Shopping Actions program is the next step in keyword-based advertising. It enables customers to have a simple way to shop for products on Google Express, Google Assistant and Search using a universal cart, no matter what device they are on — mobile, desktop or even voice activated, through Google Home. Think of Google Shopping Ads as your digital storefront and of Shopping Actions as an extension of your online store, that allows you to reach more customers. They work best together, complementing each other’s functions to gain the best possible results. Aim to use these channels as an entry platform and then retain customers onsite after that. The program actually started in 2015, with the „Purchase on Google” pilot that allowed users to click on a Shopping ad from a mobile device and check-out directly on Google. Back then it was called “Buy on Google” and was limited to a few select and major partners. At the time, the program didn’t turn into a permanent release, but the infrastructure built to support this feature and the data Google collected is now getting its chance to shine with Shopping Actions. What are the features of the GSA program and how are they different from Google Shopping? Google Shopping Actions differs from the traditional model of CPC advertising by charging a commission per transactions, similar to the Amazon model. You basically pay per transaction, not per click, with commissions ranging from 5% to 12% for top level categories like apparel and software & video games. Traffic is also not being sent directly to your website since the whole action, from start to finish, is taking place on Google’s platform. Just like with Amazon, Google owns the customer experience during these transactions. The marketplace doesn’t share specific click through rates, time on page or other information and doesn’t have the remarketing capabilities you’re used to seeing from your e-commerce store. Some retailers might prefer to own the shopping user experience, which would align better with Shopping Ads. However, keep in mind that it’s not a competition as both Shopping Ads and Shopping Actions can be run at the same time. In fact, we recommend running both Shopping Ads and Shopping Actions in order to increase your overall presence on Google properties, drive incremental sales and acquire new users. Google may be the dominant player in Search but Amazon has a hold on customers. The company’s revenue is larger than the next 10 largest retailers combined, including Walmart, Target and Best Buy. They did it by making online shopping easy and frictionless, which is great news for customers but not as much for retailers. The latter have ended up paying an average 15% commission, after membership fees and before fulfillment fees, just to be able to keep up with Amazon Prime eligible products. Find out how to start selling on Google Shopping Actions by getting in touch with an Adfix specialist! As a retailer, you’re basically at their mercy with high sales commissions, shipping and storage fees, and strict policies. Worst of all, you can’t market to directly to your customers and therefore have no effective way of getting repeat business from them. That’s where Shopping Actions can help. Where Amazon strictly prohibits its retailers from sending customers any information designed to pull them out of the Amazon ecosystem, Google Shopping Actions actually allows customers to opt in to marketing from each retailer during the checkout process. Google is working directly with retailers to make shopping on Google as seamless as shopping on Amazon, with the added benefit of also providing both the seller, as well as the buyer with all the valuable information and resources that only their search engine can. That includes order management capabilities, transaction handling, payment options, consistent experience and easing conversion friction. So far, there’s hasn’t been a marketplace like Amazon, so Google is making sure that they are creating a comparative shopping platform, so customers feel confident they’re getting the best deal available on the web. Since they’ve already got consumer trust and use under their belt, Google is now focusing on addressing purchase barriers. They’re doing it by looking to improve the buying experience, such as storing customers’ information to pre-fill while they’re shopping, enabling 1 click purchasing, a tactic previously reserved for Amazon. At the same time, the Shopping Actions marketplace revolutionizes reordering across multiple devices by making it a more intuitive experience and including the voice enabled Google Assistant. Customers are getting more comfortable using voice devices not only for queries and commands, but for shopping, with a Google Home device being sold every second and 44 percent of owners use it to order products like household items and groceries. With major marketplaces competing to control the entire retail world, finding and retaining customers can be hard, as an independent e-commerce business. 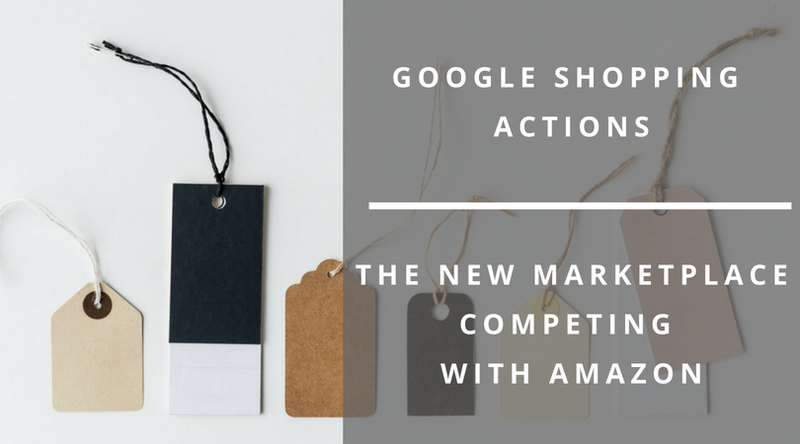 Being aware of the key differences between Amazon and Google Shopping Actions allows you to adjust your strategies accordingly. Google Shopping Actions gives you the same advantages that Amazon has, by associating your brand with Google. This adds credibility, secures customer trust, and makes transactions easy and seamless for buyers. It also allows your brand to show up the top of Google’s search results alongside brands you know and trust. Early results are showing an increase in total conversions at a lower cost on average, compared to running Shopping ads alone, with basket size for merchants increasing by almost 30% on average. It’s powered by the same feed used for Google Shopping, just with a few new fields added. At the moment, it’s only available for select categories, and requires Google’s approval. The program requires integration with Google’s Orders API.